Move the mouse over a building for a popup tooltip that shows some basic characteristics of the building. 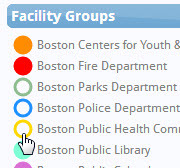 Click the building to open a panel that contains additional details. NOTE: The AEI Energy Map is normally tuned for monthly utility and main meter interval data - the San Francisco dataset has none of these details, so many panels in the detail panel will be empty. The mash-up of data for this Energy Map of Los Angeles application were drawn from some or all of the following public or subscription data sources. See ABOUT THE DATA below to understand the limitations and disclaimers about the specific data we used. Disclosure Ordinance data is provided by the City of Los Angeles and offers no warranty. The City provides the open data as-is and cannot be held liable for any errors or omissions therein, or any calculations, assumptions or conclusions based on the data. The state of the data is as it appeared in June, 2018 and may or may not be updated when the City publishes additional updates to the dataset. The AEI Energy Map visualization, all of its properties, methods, and visual design are copyright ©2018 Advanced Energy Intelligence, LLC and may not be reproduced, excerpted, hosted or IFRAMEd without our expressed written consent. The visualiztion, its calculations and presentation are provided as-is and without any warranty expressed or implied. Use at your own risk. If you wish to carry a link to this visualization, please contact us for a permalink. The City of Los Angeles did not pay AEI for this work and offers no warranty or endorsement of the work, expressed or implied. The City provides the open data as-is and cannot be held liable for any errors or omissions therein, or any calculations, assumptions or conclusions based on the data. Real-time data retrieved from California ISO is governed by their legal policy at www.iso-ne.com. We make calls to their web services on a 5-minute basis for purposes of retrieving real-time load data, and we cache the data locally to guarantee that frequency is not exceeded.